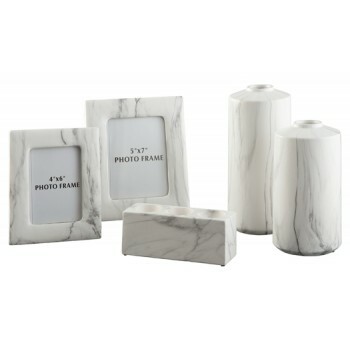 This 5-piece accessory set makes it easy to swap out your decor for a contemporary look. Dark veins in the white faux marble finish swirl beautifully. Put your pictures and favorite florals on display around the house. Light up the senses with 3 ambrosial candles in the candle holder.